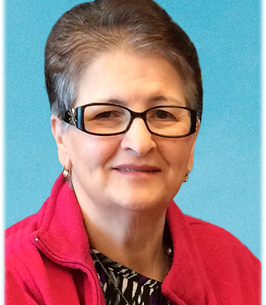 It is with great sadness we announce the passing of Maria Teresa Rossi. Maria passed peacefully at Humber River Hospital surrounded by her family on September 29th 2018 at the age of 66. She will join again her best friend, Steve (Istvan Magyar). She was a beloved daughter to mother Angelina Mancini-Rossi, and father Nazzareno Rossi (predeceased). A treasured sister to Alfonsina Frances Rossi-Doria (Stephen Doria), and will be missed terribly by her nieces and nephews; Richard Domenico Doria (Stacy Young), Anthony Nazzareno Doria (Katherine) and Christina Helena (Nick Taptelis). Always an adored Zia Maria to her great-niece and great-nephews; Chloe, Paul and Matthew, Michael and Lucas, Vincent and Jonathan. Family and friends are welcome to Bernardo Funeral Home at 2960 Dufferin Street, on Thursday, October 4th from 2-4 & 6-9 p.m. Funeral Mass will be held at Immaculate Conception Church, 2 Richardson Ave. (Keele and Eglinton) on Friday, October 5th at 10:30 a.m. In lieu of flowers a donation to CAMH, if desired, would be appreciated. To plant a tree in memory of Maria Teresa Rossi, please visit our Heartfelt Sympathies Store. We encourage you to share any memorable photos or stories about Maria Teresa. All tributes placed on and purchased through this memorial website will remain on in perpetuity for future generations. Sincere Concolences from Lili & Staff. Maria will be missed. Dear Fran and family, our deepest condolences, we are thinking of you in this time of sorrow, I know Maria is finally at peace. Fran, I am so sorry for the loss of your sister, Maria. Big hugs to you and your family. Please accept our deepest condolences for your family's loss. Our thoughts and prayers are with you during this difficult time. We are so sorry for your loss. Please accept our deepest condolences. My condolences to you all from Vannett and the management team at West Park LTC.